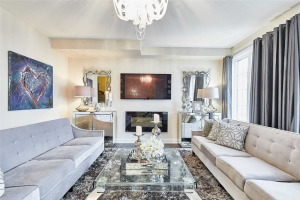 2 Years Old Luxury Freehold Townhouse Backing To Ravine ! Magnificent Stone Front & Stucco Exterior, Double Garage, 3 Bdrm. 9' Ceiling On All 3 Levels. Modern Kitchen W/ Quartz Counter-Top, Iron Picket Stairs, California Shutters In All Rooms. Direct Access To Garage, Walk To Bus, Plaza & Parkette. All Elfs, Pot Lights, Fridge, Dishwasher, Stove, Fireplace, Washer, Dryer, Cac.